American Shorthair Cats are an easy to care for breed of cat. They have no congenital health issues, no special diet requirements and are happy, social pets. They are hardy, intelligent, affectionate and make ideal house cats. Mature American Shorthair cats will usually weigh 11 – 15 pounds for the males and 8 – 12 pounds for the female. It won’t take much to keep your cat or kitten happy – a lot of love, good food, clean water, a safe environment and good health care. At our cattery we specialize in the beautiful classic silver tabby coat with emerald green eyes. Though we can’t guarantee every kitten will develop the stunning green eyes, many of our kittens will exhibit this feature. Occasionally, we may also have other coat colors available. All of our kittens will be sired by one of our gorgeous sons of champions, Mr. Silver Shadow, Juni-Purrs Ubiquitous, or by ZPurrz Basilton, our gorgeous son of a grand champion. We have been shipping our pets on the airlines for over 20 years. We offer guaranteed, safe, airport delivery of your kitten, or you can pick up your kitten here on the farm. Please follow this link: Available kittens to find more information about our cats and availability of kittens. The American Shorthair is well known for its general good health and good disposition. American Shorthairs are basically low-maintenance cats. Males are larger than females, weighing 11 to 15 pounds when fully mature. Females weigh 8 to 12 pounds when they fully mature (at 3 to 4 years of age). 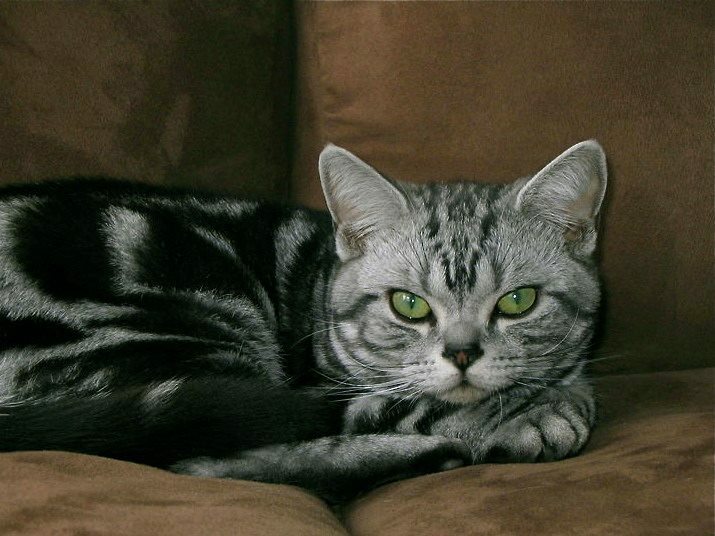 American Shorthairs can live as long as fifteen to twenty plus years if living indoors and given proper health care. The American Shorthair comes in more than 80 different colors & patterns ranging from black to white, and a variety of colors between. We raise the Classic silver tabby, which has black markings set on a silver background, (the typical bullseye pattern seen on the side of the cat). The American Shorthair consistently ranks as one of the ten most popular breeds of cat. The American Shorthair was developed in America. It is thought that its’ ancestors came to North America from Europe. It is possible that the “Mayflower” carried several shorthair type cats to hunt the ship’s vermin. For hundreds of years, these “working cats” lived with their owners on farms and rural areas and eventually established themselves as the native North American Domestic shorthaired cat. Early in the 1900’s those persons who deeply appreciated all the values of the North American Domestic cat carefully collected the best examples of the cat and began to raise them as a breed keeping the original good health and stature and temperament in mind, being careful not to infuse the new longhaired and other breeds that were being imported from Europe at the time. The Cat Fanciers’ Association (CFA) officially recognized The American Shorthair as one of its first five registered breeds in 1906. Originally known as the Domestic Shorthair, the breed was renamed “American Shorthair” in 1966 to differentiate it from any other shorthaired breed. The name “American Shorthair” also reinforces the idea that our native North American shorthaired cat is distinctly different from cats that may be found in the streets, neighborhoods and barnyards (which are often crosses of many different breeds of cats).